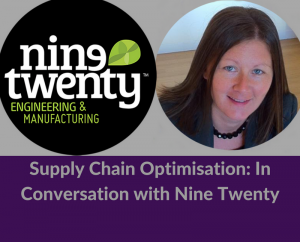 Supply Chain Optimisation: In Conversation with Nine Twenty. Karen Stewart Nine Twenty Engineering & Manufacturing Director, met with our Managing Partner, Lee Ann Healy to discuss Supply Chain Optimisation. The discussion touched upon how best to approach a project, process improvement and technology solutions for the industry.